Exactly how much has John Wall meant to Washington since he returned from injury last month? 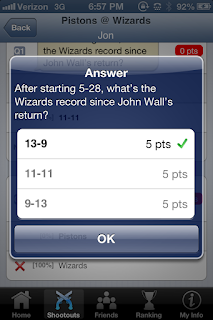 To determine who knows their hoops stars, we tested our SnapCall audience during the Wizards' game against the Pistons. As the correct response indicates, the Wizards have been on fire, at least by the standards of a dysfunctional team. During the offseason, when word first leaked that Wall would miss significant time with a knee injury, a collective gasp could be heard around Washington, D.C. The former first overall pick was the team's heart and soul, the shoulders upon which the Wizards leaned in late-game situations. With Wall, Washington held aspirations of making the playoffs for the first time since the Wild West era of Gilbert Arenas. Without Wall, let's just say their goals became a bit more modest. Unfortunately for the nation's capital, even by their recalibrated standards, the Wizards' season started out as a disaster. A.J. Price, who had never held a starter role in the NBA, was forced to run the show. Players seemed lost on the court. New front-court acquisitions Nene and Emeka Okafor were burning an unnecessary hole in Washington's pockets with their combined $26.5 million contracts. Things couldn't have been much worse, and after two and a half months, the Wizards found themselves with the worst NBA record at 5-28. Things looked bleak, but the sun began to peak through the dark clouds that hung over the Verizon Center. Their star was ready to return, and any Wizards fan – delusional or cynical – knew that it could all turn around soon. Remarkably and immediately, the Wizards began to win on a consistent basis. Not just against the bottom of the NBA barrel. Over the 22-game stretch since Wall's return, Washington has wins over playoff-bound teams such as: Atlanta, Denver (twice), Chicago, New York, Brooklyn, Milwaukee, Houston and the Clippers. Wall is averaging 14.0 PPG and 7.5 APG since his return. However, numbers don't tell the entire story. In just his third season, John Wall has emerged as a leader. But perhaps more importantly, his presence enables the other players in the Wizards' lineup to play their respective roles originally envisioned by GM Ernie Grunfeld. A.J. Price comes off the bench instead of running the point. Bradley Beal can focus on scoring instead of distributing, Garrett Temple is no longer burdened with 47 minutes against the likes of Brooklyn's Deron Williams and Joe Johnson. So cheer up, Wizards fans. John Wall is here to save the day.